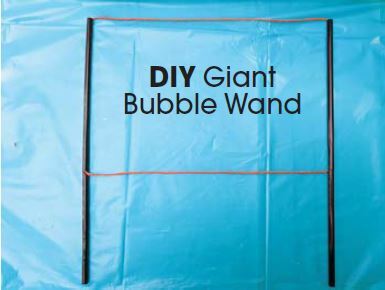 To make giant bubbles, you need a special wand, the right solution, and patience. You can make your own wand out of cotton yarn and four straws. Cut the string to at least 4x the length of one straw. 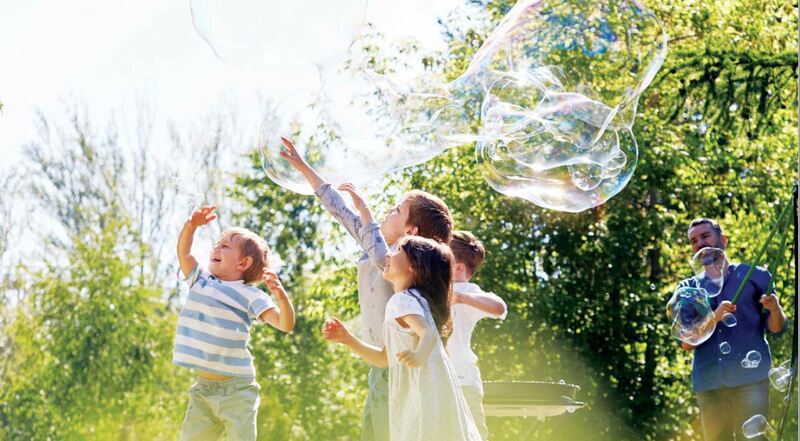 The longer your string, the larger your bubbles – but small children may have difficulty with a larger wand! Thread the string through two of the straws and tie the ends together to form a loop. Tuck the knot inside one of the straws. The other two straws will be the wand’s handles. Pinch one end of each of these straws and tuck them inside the first two. Your big bubble blower is complete! Submerge your wand in a pan of bubble solution (slightly larger than your wand). TIP: Don’t blow giant bubbles with your mouth! Instead, drag the bubble blower slowly through the air, careful not to break the soap film.